How can we reduce the costs of filtered water production? The need for a healthy lifestyle has made people more health conscious, especially with respect to drinking water. 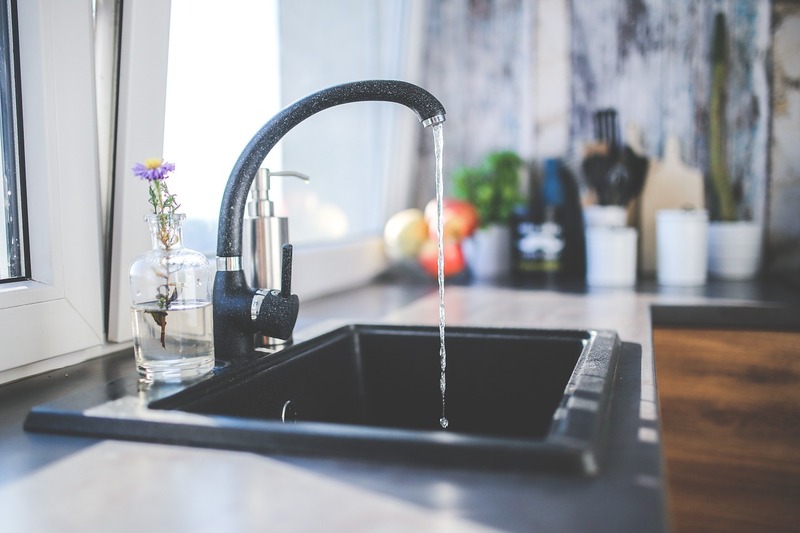 Consumers particularly want filtered water, which they view as safer than tap water. However, the increasing demand for filtered water has accelerated the production of plastic bottles. This consumes petroleum and leads to plastic waste. A household that consumes 1.5 litres of [bottled] water per day indirectly consumes 500 litres of oil through the production and transportation of that water, according to Richard Biagoni, CEO of EIT InnoEnergy France. Additionally, bottled water costs significantly more than tap water. To tackle these issues, French startup Solable developed LaVie to “transform” tap water to filtered water. How does LaVie provide high quality water? 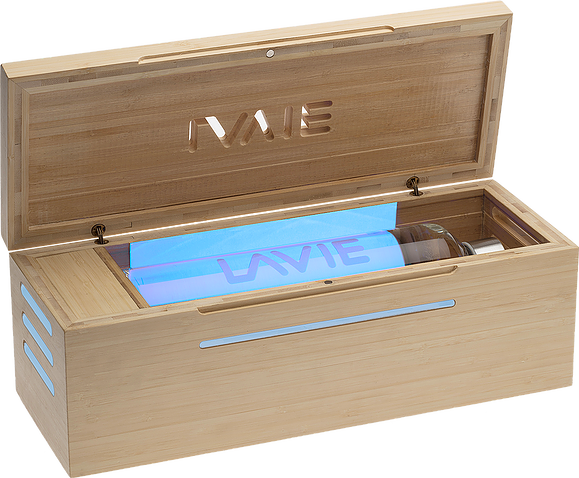 LaVie uses a bamboo box (as seen in image) in which a glass bottle filled with tap water is placed. UV-A rays bombard the bottle from all sides. Normal tap water contains chlorine. Chlorine and its derivatives in tap water are considered carcinogenic in Europe and the United States. Due to the UV-A rays, photodissociation of chlorine happens in the water to release a lot of free radicals. The chemical reaction behind this technology is homolytic fission. The hypochlorous acid (HOCl) in the water undergoes homolytic fission to break into atoms, with each atom holding a single unpaired electron. These are the free radicals. These radicals come in contact with bacteria, viruses, pesticides and medicines to chemically disrupt them. How is it safe and sustainable? The treatment time for 1 liter of water is 15 minutes. It consumes 10 Wh/Liter, which means 500 liters of water costs only about one dollar of electricity. The system features automatic start and stop, which helps save power. The electricity powers the LED lamps that generate the UV-A rays, which pass through the UV transparent borosilicate tempered glass bottle. Unlike filter jugs and reverse osmosis, filters are not used, so all trace minerals remain in the water. This can contribute to better tasting water. Further, the bottle is sterilized in every treatment cycle, prohibiting the growth of bacteria inside the bottle. Lastly, the LED has an average life expectancy of 10 years. This is the only part of Lavie expected to require replacement. LaVie is currently raising money through a crowdfunding campaign. While it remains to be seen if it will become a popular alternative to other water filtration methods, the low price of modern UV LED lights suggests that we may see other competitors trying to offer consumers a new way to enjoy cleaner water. Interested in exploring more sustainable innovations in water filtration? Feel free to reach out to Kyle Gracey (kgracey@prescouer.com), PreScouter Project Architect and natural resources industry thought leader. Kishore is almost done his Master's in Industrial Engineering and Management at Tampere University of Technology, Finland. He did an Erasmus exchange program at Technical University of Darmstadt, Germany where he completed his thesis on procurement optimization for automobile part logistics using asset monitoring solutions. He has worked with startup companies where he did market research and found supply chain solutions. He earned a supply chain certificate from Massachusetts Institute of Technology after completing series of SCM courses. He holds a Bachelor's degree in Mechanical Engineering. During his free time, he coaches tennis for adults in Estonia and is also a US PTR approved tennis professional.